This months Thoth tip is centered around the Ace of cups. 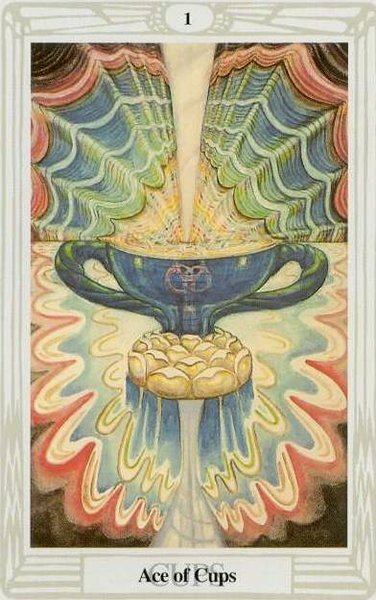 This card is very bright and shows an overflowing cup surrounded in many colours, blues and reds and spiritual whites. It is fed from the source by a brilliant white light. In many ways this is like our own deep souls, fed from the source and lighting the way in the darkness. There are three interlocking circles in the center of the cup and these can be seen as ideas of the triple Goddess, the trinity, the upper triangle of the tree of life, Isis Osiris and Horus and other ‘tri’ aspects of the God head – The card itself being the highest potential of the emotional world and the top of the Tree of life – love connected to the highest source. I have often seen this as a commitment to love in a relationship and the possibility of children from that union. The very beginning of things – the emotional desire for union with another. Love and new relationships are also very frequently shown through this card. It is primarily the connection with the source of all love though, our own high self-esteem and unconditional love of oneself. When you find yourself in this place it is like nothing external can touch you as you know you have all you need for joy within you. One of my favourite cards and a good one to meditate upon when you are feeling low. It can also mark the start of an important love relationship where love is the foundation and that each person has love for themselves as the root of love for the other and so the relationship loses its needy feel. Meditating on Love as an energy source to motivate all action. Focusing on unconditional love of yourself, even just to acknowledge that this is possible even if you are in a place of feeling low can help you move towards it. Imagine yourself sitting in the center of the cup and allow yourself to receive its healing energy from the course and rebuild you.